A man in Hà Nội has the largest collection of bicycles that were made in France, in the whole of Việt Nam. One hundred and thirty of Đào Xuân Tình’s bicycles are made by the company Peugeot. They are worth lots of money. The French Embassy has even borrowed one from him for a display. For collector Đào Xuân Tình, a Peugeot bicycle manufactured in France is not only a vehicle, a hobby or something to collect. It’s a symbol of the past, a part of his childhood and memories of his father. Now, he owns a collection of nearly 130 Peugeot bicycles. 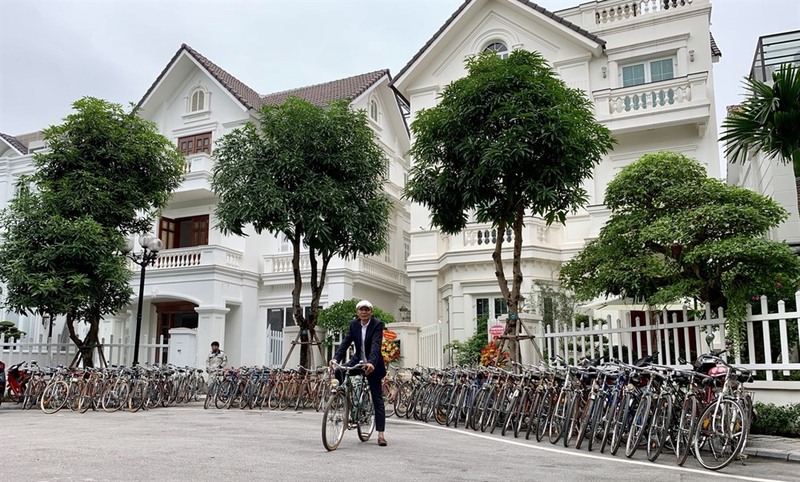 The Việt Nam Record Organisation (VietKings) recognised that he has the biggest collection of Peugeot bicycles made in France. The collection is worth a lot of money, according to Tình. “In the past, people often walked or used public transport. Only wealthy people could afford a bicycle,” said Tình. “The Peugeot brand from France is considered the most elegant and luxurious,” he said. During the colonial time, the price of the first Peugeot bike he owned was equivalent to a house in a small lane of Hà Nội. Each Peugeot bicycle had a licence plate and vehicle certification of ownership like motorbikes and cars. People even had to identify the source of the bicycle and prove the source of money spent to buy it. “So, owning a Peugeot bike is a dream of many people,” said Tình. His father had a Favourite bicycle and he loved it very much. Unfortunately, the bicycle was lost. Tình tried to buy a similar model but was unable to until his father passed away. Many years later, when Tình bought the bicycle, he brought it to his father’s altar. Since then, collecting bicycles has become a passion. Tình has three criteria for his collection: produced in France, original and as new as possible. “Peugeot bicycles produced in different years have different styles, forms, even different details such as head badges with the symbol of the brand -- a lion,” said Tình. Tình praised Peugeot as the only brand that offers elegance and convenience for users. Peugeot produced two types of bicycles, for men and women. Those produced for women were more expensive because they are easy to use, and suitable for teenagers and the elderly. Meanwhile, those for men had a big frame that only men can ride. Tình tries to collect the bicycles in pairs. When he has a bicycle for men, he will try to find another one for women which was produced in the same year and had the same design and colour. Once he met the owner of a 1950 Peugeot bicycle in Germany. The bicycle was beautiful and like new, but the owner didn’t want to sell it. Tình tried to convince him. He expressed his special love for Peugeot bicycles and talked about his collection. He also promised that he would take care the bicycle. Finally, the owner agreed. Sixteen years later, Tình found the female version of the Peugeot bicycle. He couldn’t believe his eyes. He invited the former owner of the 1950 Peugeot bicycle to Việt Nam to see them. “He could hardly say anything, just embraced me and we understood the happiness of the moment,” said Tình. Tình and his wife rode the pair of bicycles around their houses. They all felt happy. In the collection, there is a precious bicycle made in 1918. Tình bought it during a trip to France. Its owner told him that the bicycle was very old and he can give it to Tình for free or at any price Tình wants. “When I saw the bicycle, I thought it was very new actually. It was just covered in dust and grease,” said Tình. When the bicycle was sent to him, he was so happy he couldn’t sleep. On the next day, he rode the bicycle around West Lake. Suddenly, he found many other cyclists gathering around him. He stopped to have a rest on Thanh Niên Road. The riders then came up to him to admire the bicycle. Tình dreams that one day he can have a large space to showcase the collection in public. For him, collecting Peugeot bicycles is not a high-end and costly hobby. It’s a healthy lifestyle. “Through the collection, we can remind the young generation of those things which have gone, we can talk to each other about passion and the beautiful life,” he said. For collector Đào Xuân Tình, a Peugeot bicycle manufactured in France is not only a vehicle, a hobby or something to collect. A hobby is an activity that you enjoy and that interests you, which you do in your spare time. It’s a symbol of the past, a part of his childhood and memories of his father. A symbol is something, like a bicycle, that represents something else, like days gone by. Memories are flashes in your mind that help you remember days gone by. Việt Nam Record Organisation (VietKings) recognised that he has the biggest collection of Peugeot bicycles made in France. Recognised, in this case, means accepted. Public transport is transport that anybody may use, rather than private transport, which is usually used only by the person who owns the vehicle and people he, or she, chooses to allow to use it. Examples of public transport are most buses and trains. Only wealthy people could afford a bicycle,” said Tình. Economic subsidy means help to do something by being provided with money. An economic subsidy era is a time in history when this happened. Luxurious means comfortable and smart. The colonial time was the time when Việt Nam was ruled by another country, which was France. Equivalent means “equal in value”. Each Peugeot bicycle had a licence plate and vehicle certification of ownership like motorbikes and cars. A certificate of ownership is a document that shows you are the owner of something, which in this case is a bicycle. People even had to identify the source of the bicycle and prove the source of money spent to buy it. The source of the bicycle is the place it came from. To identify the source means to point it out. Unfortunately, the bicycle was lost. Tình tried to buy a similar model but was unable to until his father passed away. “Passed away” is a gentle way of saying “died”. Since then, collecting bicycles has become a passion. A passion is something you love so much, you don’t worry too much about how much time or money you spend on it. Criteria are things by which something is measured. If something is original it is not copied from something else. Convenience means being able to do something without any difficulties getting in the way. “Many businessmen and intellectuals love this brand. Intellectuals are clever people who think a lot about things. A mechanism is a system that involves mechanical parts that work together. A slope is a gentle hill. Tình tried to convince him. To convince someone of something means to make them change their mind. The riders then came up to him to admire the bicycle. To admire a bicycle means to like and respect it. An auction is a sale at which something is sold to whoever offers the highest price. You and your brothers and sisters are one generation. Your parents and their brothers and sisters are another. Your grandparents and their brothers and sisters are yet another generation. And so on. The generation that are children now are the “younger generation”. 1. The Sputnik is a brand of bicycle from Russia. 2. Đào Xuân Tình’s father had a favourite bicycle, which he had for his whole life. 3. When Đào Xuân Tình was once in another country, he met the owner of a 1950 model Peugeot bicycle,. 4. The owner of the 1950 Peugeot would not agree to let Đào Xuân Tình buy it. 5. Đào Xuân Tình believes that good physical health leads to good spiritual health.